At this level, your basic French vocabulary should be good. The more French you read, the better you will acquire new words and feel comfortable with what you already know. The following vocabulary list should help you review. It organizes words into logical categories. This will make memorizing them easier. Look through each category and concentrate on the words you don’t know or words that seem to be cognates but in fact have very different meanings. If you really want to imprint new vocabulary words on your brain, passive reading is not enough. Critical reading with a dictionary at hand, as well as listening and watching French media, will increase your vocabulary significantly. Try one or more of the following techniques to help your learning. Put the French word on one side, the English on the other. If you want to get fancy, color-code by category or make up a symbol. This way, you can mix up words in any order and regroup them in many different ways, such as where, when, and how the words can be used. 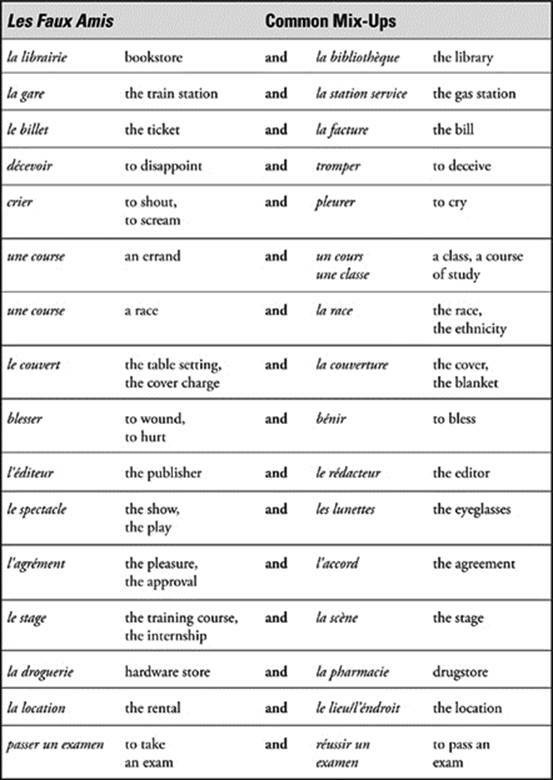 On the French side, include part of speech, gender, and the word used in a sentence. Whenever you have a few minutes, pull out your cards and test yourself. Think of this as a game. If it works for you, think of a funny image or sound that corresponds to the word. The more outrageous, the easier it will be to remember. Make up your own mnemonics and add them to your flashcards. Make a list of words and definitions and hang them on your wall. As you go about your day, glance at the poster and review a few words. These are only a few of the ways you can work on your vocabulary. Anything you do to make it more creative or colorful (literally—use colored pens, colored index cards, stickers, or markers) will increase your ability to learn and remember vocabulary. This section will help you review key vocabulary words. It is not the only vocabulary you need to know for the test, however. You will find suggestions for how to continue enriching your vocabulary. Pay particular attention to the commonly mixed-up words and false cognates. Tu me manques, or vous me manquez. Elle a manqué son gateau. Sentir means “to smell” (having an odor or noticing an odor). Elle sent quelque chose de bon dans le four. She can smell something nice in the oven. Ressentir (+ noun) means “to feel” (a pain or an emotion). It’s going to get better! Review the categories of vocabulary and use the study technique that works best for you.